The Keystone Packard Dump Truck. Heavy Gauge Steel toys were very popular throughout the 1920's all the way through the World War II era, when all resources went towards the war effort, and no steel toys were produced. Prior to the first World War, most of the toys in the United States were from overseas, mainly Germany, France, Austria and England. However, after the first World War, America led the toy industry throughout the world. Within the US there were several large toy manufacturers. 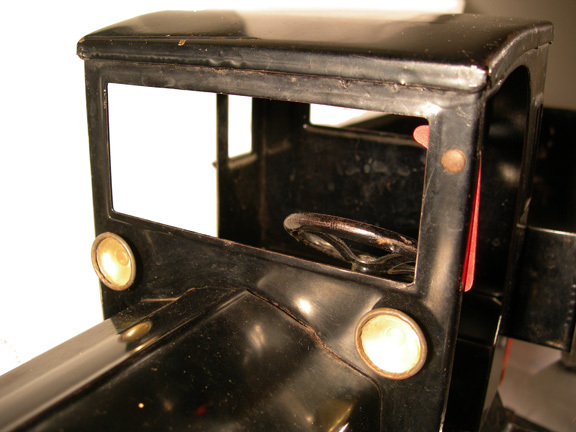 The two largest pressed steel toy makers were Buddy "L" and Keystone. 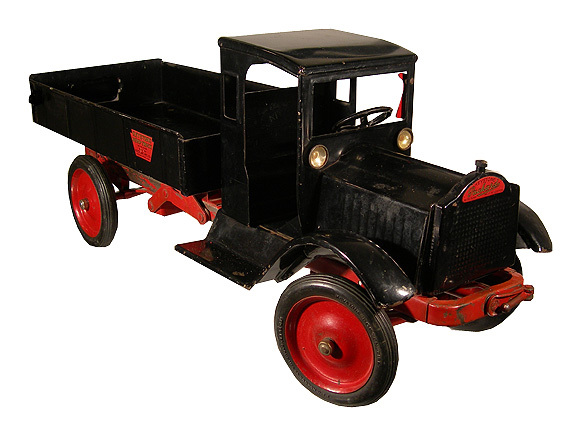 The pressed steel toy truck pictured above was produced by the Keystone Manufacturing Company. The company was formed by the partnership of brothers Ben and Isidore Marks. The Marks Brothers Company was established in Boston, in 1911 supplying human-hair doll wigs and celluloid doll heads. 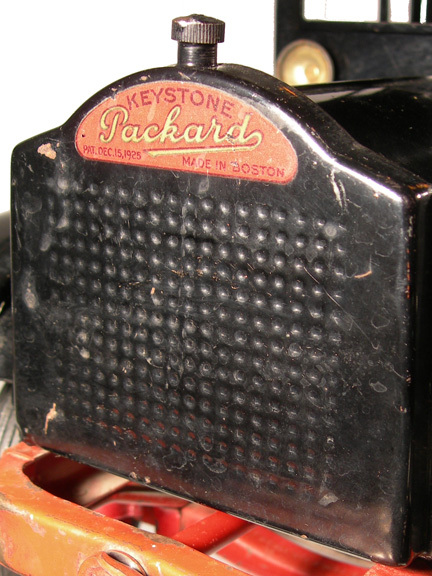 Changing their name to Keystone, in 1919, they went on to add a variety of toys to their product line, including a moving picture machine that became quite popular. The company noticed the increase in the number of pressed steel toy autos being produced by several other toy manufacturers, and decided to jump on the band wagon. Wanting to separate themselves from other toy manufactures, Keystone looked for a certain niche in the market that would give their toy autos an individualized look. "The company decided to approach the Packard Motor Company and ask for permission to recreate and market trucks modeled after the popular Packard design. 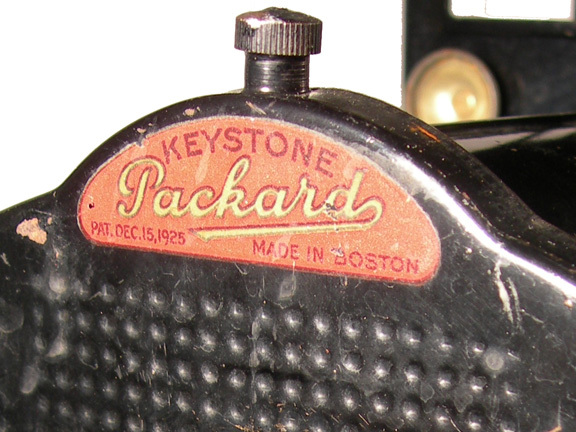 The request was granted, and the Keystone Packard Truck included the popular radiator design and logo" (fabintoys.com). 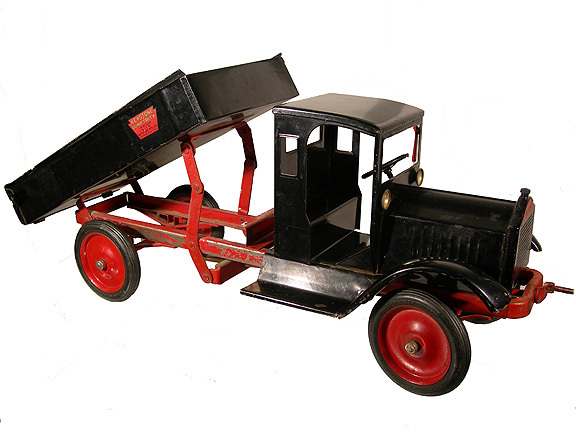 First patented in 1925, Keystone's Packard Dump Truck was 27 inches long, 10.5 inches tall and eight inches wide, and weighed 12 pounds. The truck featured a 22-gauge, cold-rolled steel body, nickel hub and radiator caps, a front crank for dumping, headlamps, steering capabilities, and, according to fabintoys.com, for 50 cents extra, rubber tires. 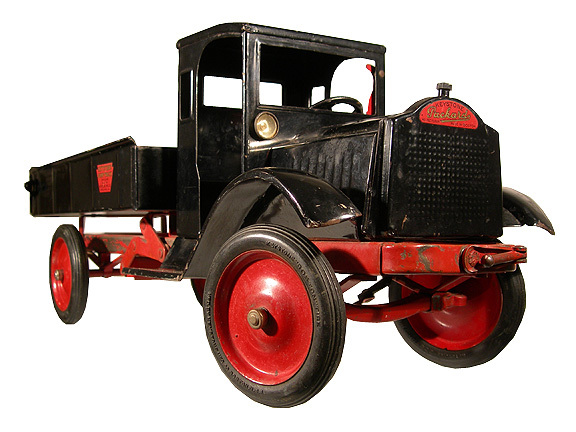 The Packard Truck Line eventually became so successful that it came to rival the market leader, Buddy "L." According to one of Keystones advertising campaigns they guaranteed that a 200-pound man could stand on their pressed steel truck without damaging the toy. 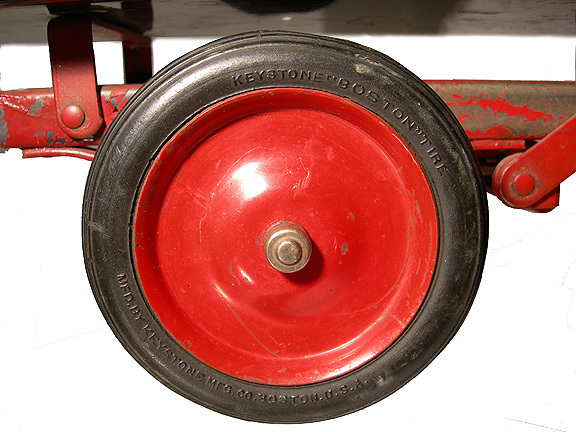 Over the next 25 years, Keystone produced a number of different pressed steel toys, including, trucks, airplanes, trackless trains and construction toys. They even patented the very first real water-squirting fire truck, and a "Hydraulic Lift" dump truck. Eventually Keystone introduced the popular "Ride 'Em" series of toys, in which small children could sit on and steer the toy. The Keystone Manufacturing Company eventually went out of business in 1957. Click here to view a reproduction Keystone Toy Catalog from 1925. The information used to compile this article was found at www.fabtintoys.com, from Buddy "L" Toys, by Albert W. McCollogh, and American Transportation Toys, by Joe and Sharon Freed. Below are a few images of the Keystone Packard Dump Truck, part of the Antique Warehouse collection, click on any of them to learn more about this toy.